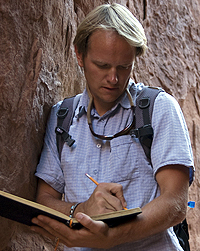 Chad is an award-winning artist based in Moab, Utah. He creates acrylic paintings, pastel drawings, and linocut prints inspired by the open spaces of the Colorado Plateau. His work has been featured in A Century of Sanctuary: The Art of Zion National Park,Painters of Utah's Canyons and Deserts, and on NPR's Radio West. Niehaus is currently serving as the official Community Artist in the Parks at Arches and Canyonlands National Parks.